One of the finer Key West restaurants is nestled among the charming tropical back streets of Key West's Old Town District. Come discover a garden oasis where Chef Michael Wilson and his wife Melanie offer a classic menu with an island twist. 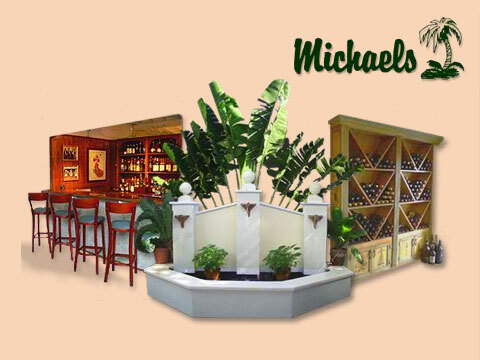 Their emphasis on quality and service, coupled with casual island elegance, has established Michaels Restaurant as a favorite of Key West locals and visitors with discriminating dining palates. While visiting Key West we were looking to have a nice dinner outside. At Michaels Restaurant outdoor dining is an option and the atmosphere was perfect. The meal was sumptuous and the dessert was to die for! That chocolate volcano MMM! But we are drinkers and we loved the separate martini and wine menus. We sampled quite a few! Take someone special for no special reason at all! A culinary delight! Some restaurants feature incredible food, others have ambiance, still others have a comfortable feel with gracious staff. Want all of this? Go to Michaels. The food is exceptional - from creative salads and appetizers to fine entrees and desserts - with a variety to please any palate. Michaels is simply the place to dine in Key West. My favorite restaurant in the Florida Keys, scratch that, in all of Florida. The food was great, the service was wonderful, and I had one of the most pleasurable times in my life. By far the finest experience that my wife and I have had on our trip to Key West. Chef Michael and Melanie Wilson were the perfect hosts. The food was unbelievably prepared with healthy servings. I highly recommend for the first timers visiting Key West. Overall a GREAT experience and meal. The staff is great, relaxed, calm, knowledgeable and professional. The number one steak house in Key West. If the seafood was any fresher it would slap you.